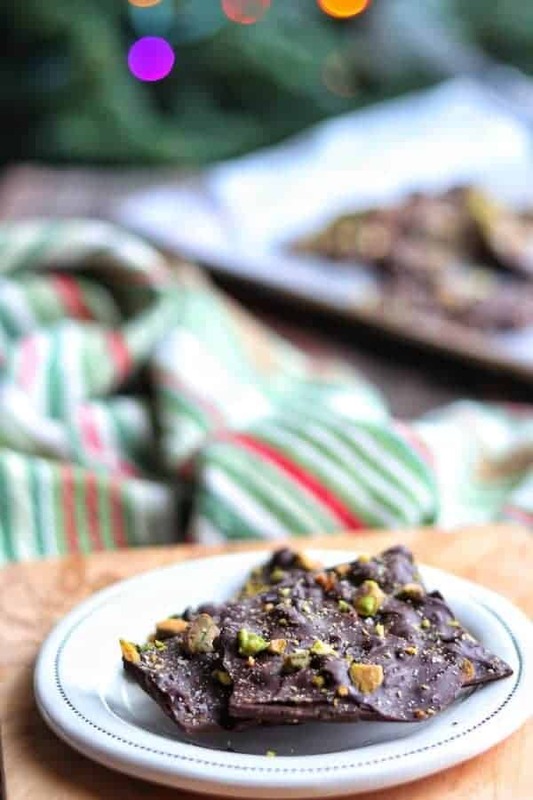 A dark Chocolate Bark recipe that is a delicious Christmas bark recipe for the holidays. This pistachio loaded Christmas candy might look complicated, but it’s really simple to make taking just 5 minutes. It’s the time of the year when holiday parties are in full force. 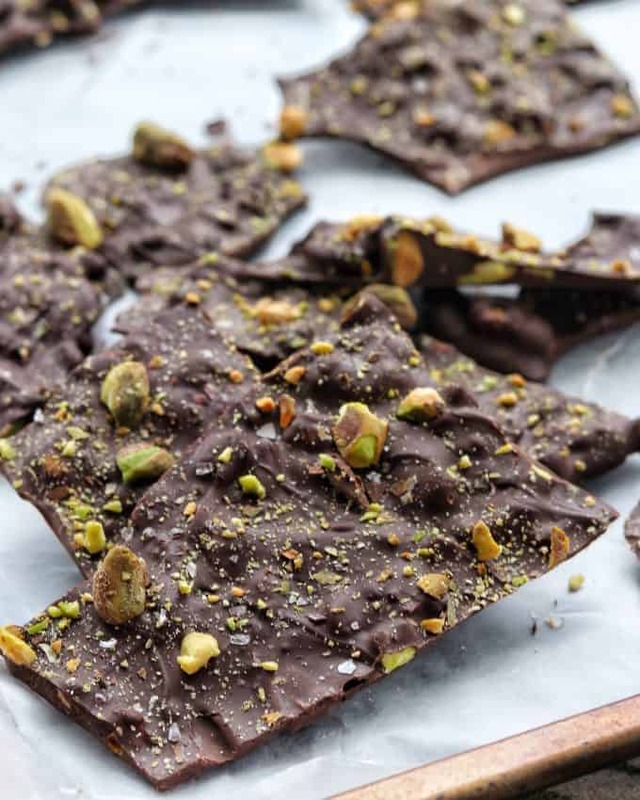 This year, stand out from same old Christmas cookies or your coworker’s jam-filled cookies and share this simple, yet gourmet, chocolate bark recipe. Whether you need a sweet treat to bring to the office, as a teacher gift, or for your New Year’s Eve party, you’ll love this simple dessert. 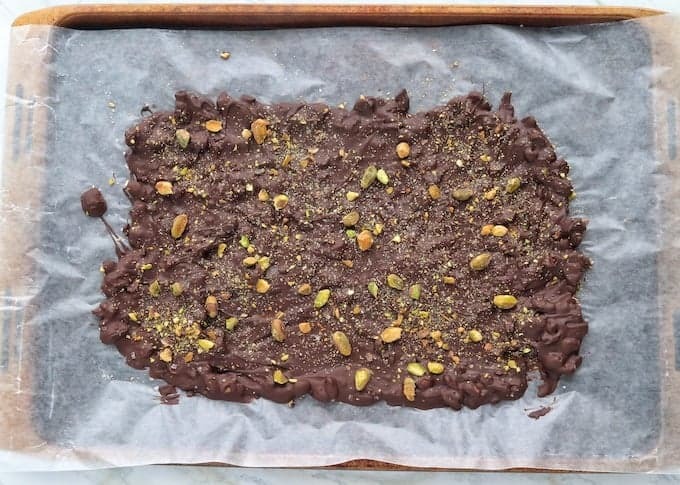 And dare I say it’s a healthy chocolate bark recipe – and that’s not frequently stated about Christmas candy! 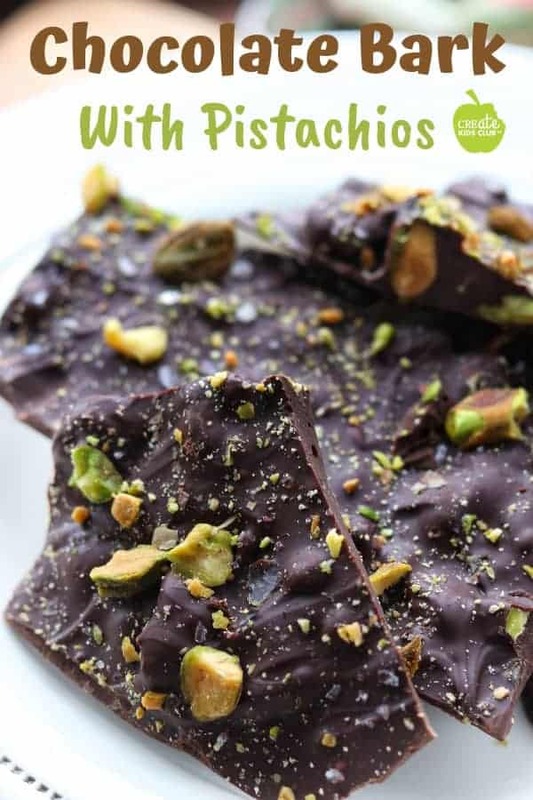 This Christmas Bark recipe is loaded with pistachios then sprinkled with coarse sea salt for a gourmet chocolate bark that will be the talk of the party! While chocolate bark candy looks complicated, it takes less than 5 minutes to make (not including sitting time to cool). Watch the step by step video for instructions or keep reading! 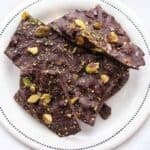 What Can I add To Chocolate Bark? Kitchen Tip: To save time, buy pre-shelled pistachios. To save money, buy pistachios with the shell on and remove them yourself. Prepare a sheet pan with wax paper or a silicone mat. 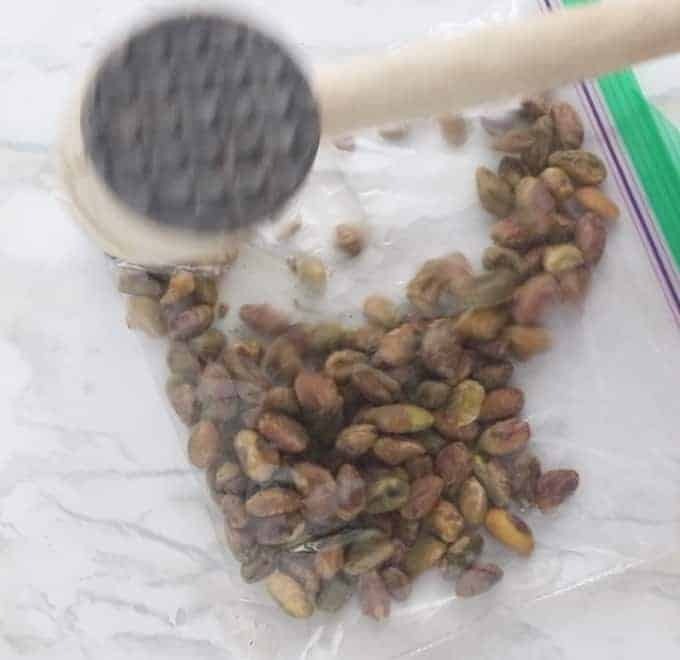 Place pistachios into a ziplock bag and crush with a kitchen mallet or rolling pin. Set aside. In a medium sized microwave safe bowl, add chocolate chips and microwave for 90 seconds. Stir. Continue to microwave in 15-second increments until chocolate is melted. 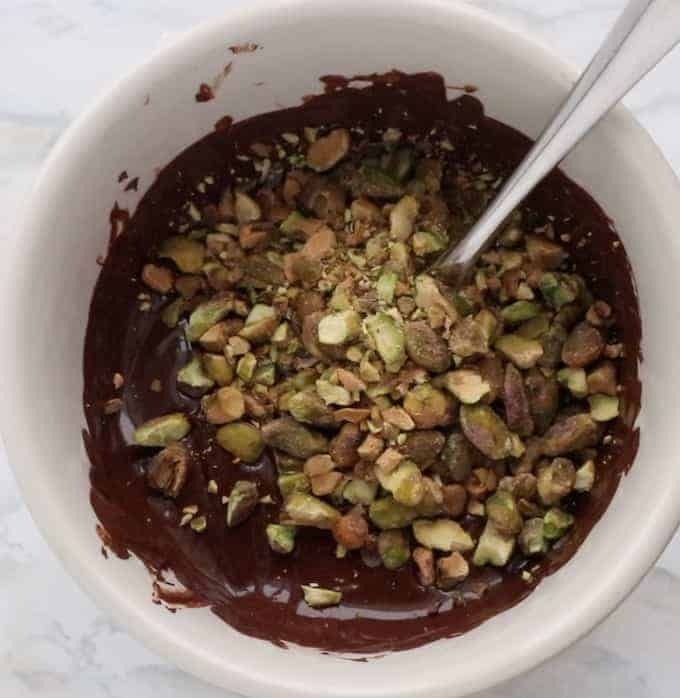 Stir pistachios into melted chocolate. 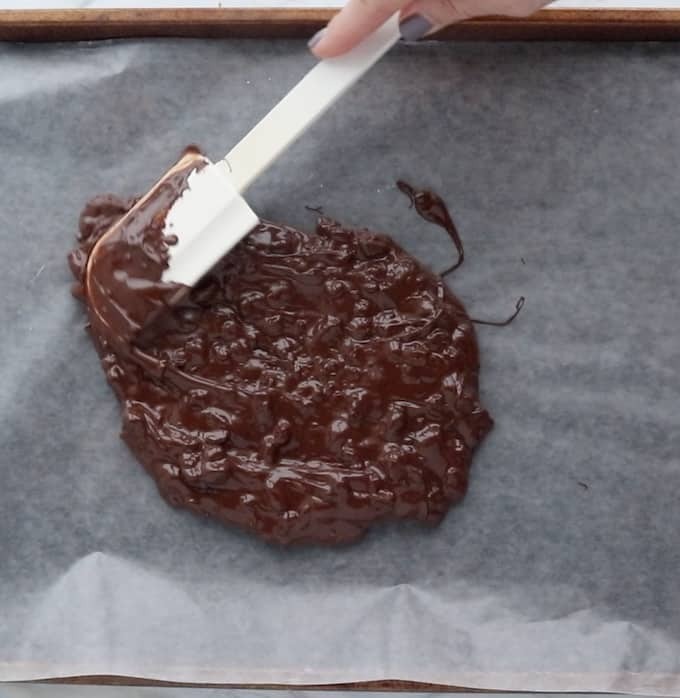 Spread chocolate mixture onto wax paper with a spatula. Sprinkle coarsely ground sea salt on top. Let cool until hardened, then break into pieces. Start by crushing pistachios with a kitchen mallet or rolling pin. While this step may help relieve that holiday stress, it’s also a fun job to have your kids do. Once the pistachios are crushed, set them aside. Kitchen Tip: To save a little money, use bricks of chocolate that are widely available this time of year. Use a knife to break it up into smaller chunks so it melts quicker. How Do You Melt Chocolate For Bark? 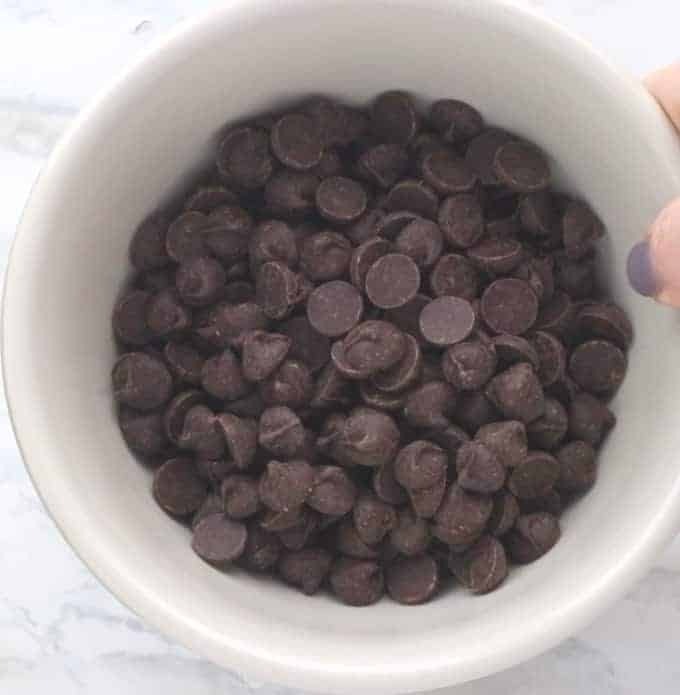 Pour the chocolate chips into a microwave safe bowl. Place the bowl of chocolate chips into your microwave for 90 seconds. 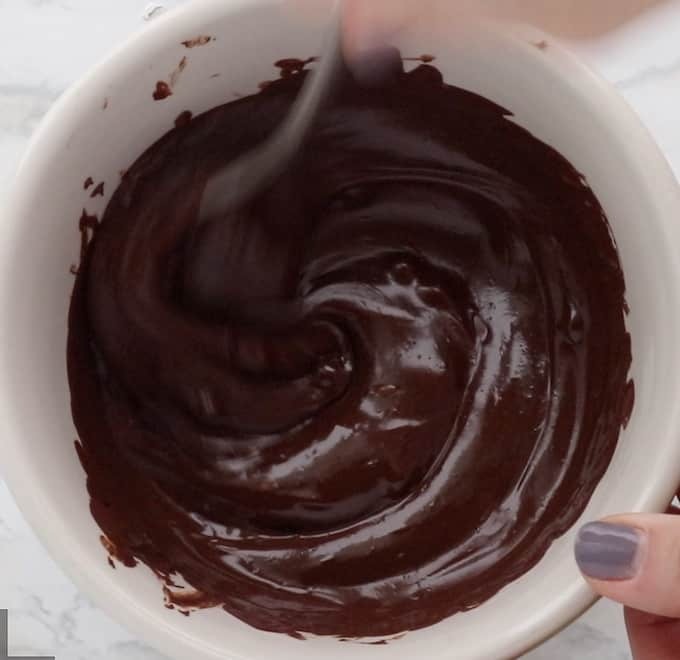 Continue to microwave in 15-second increments until the chocolate is just melted. Next up add the pistachios. I like to keep it simple with just this ingredient, but feel free to get creative in this step. See above for all kinds of fun ideas! You could even break up Christmas cookies for a chocolaty cookie bark or use crushed pretzels or graham crackers too. What doesn’t go well with chocolate? Pour the melted chocolate mixture onto a wax paper covered baking sheet and spread the chocolate out with a spatula. Kitchen Tip: If you want thick pieces don’t spread the chocolate too much, for thinner pieces spread the chocolate out thinly. Sprinkle with coarsly ground sea salt (skip if you’re not the sea salt and chocolate kind of gal) and more crushed pistachios. Once made, keep this Christmas bark recipe in an airtight container in your dark pantry or in the freezer. 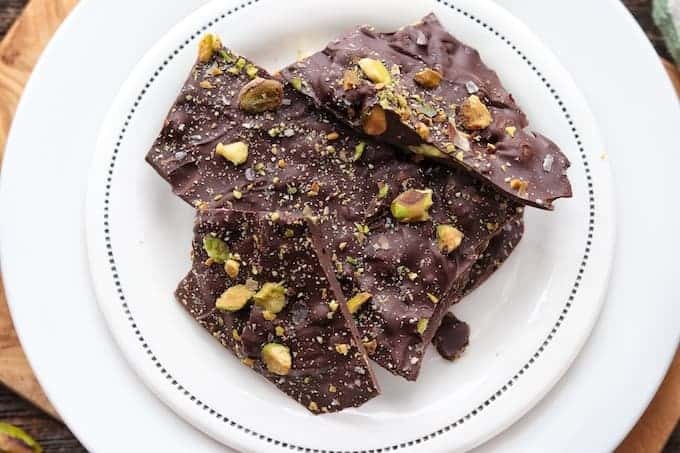 Kitchen Tip: Chocolate picks up the flavors of other foods easily so if you’re going to refrigerate, make sure to wrap this gourmet chocolate bark well to keep it from absorbing the flavors around it. Other festive ideas to serve this holiday season include Hot Chocolate Bombs with Homemade Whipped Cream, a Cranberry Spritzer, and Beef Tenderloin. A dark Chocolate Bark recipe that is a delicious Christmas bark recipe for holiday parties. This pistachio loaded Christmas candy might look complicated, but it’s really simple to make taking under 5 minutes! Stir most of the pistachios into melted chocolate. Reserve some to sprinkle on top of the finished product. Sprinkle coarsely ground sea salt and the rest of the crushed pistachios. Additional options include adding other nuts or seeds, using milk chocolate, adding toffee nougats, or dried fruit. I made this over the weekend and it really was super easy and looked beautiful, but tasted even better! Thank you!